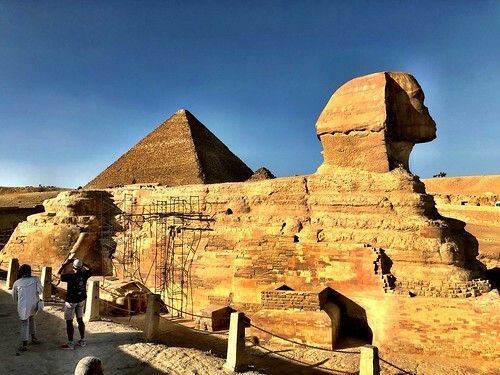 Life in Egypt was amazing during the 6th Annual Nomadic Journey as everything was aligned with the Kemetic stars during my quick and impromptu trip to witness the Pyramids of Giza and the Sphynx in person. See, Giza is the only architectural creation standing from the ancient 7 Wonders of the World so it was important to see the profoundness directly. I also experienced the Nile River by boat of course, took a tour to the Egyptian Museum for inheritance of cultural history and later learned how the people of Kemet made papyrus paper. Of course, my energy was spent after the long day of exploration therefore I was highly amazed after the tour guide, Ali of Wonders of Egypt Tours, introduced me to Egypt’s Koshari national dish which was divine. Koshari is a super meal made from macaroni noodles, lentils, rice, chickpeas and spiced tomato sauce. The culinary enjoyment has cultivated even more interests toward the African nation. Being that my father first introduced me to the Kemetic world as a child the Nomadic Journey was historic. As well, I am named after the deity Ma’at who judged the level of man’s truthfulness during living years. More importantly, no day shall pass where you won’t see the inspirational Ankh around my neck along with the scarab beetle since the Key of Life was a symbol of eternal living to the Pharaohs. Once I returned home to Maryland it was my duty to present Koshari to the family which was a major hit. Everyone loved it, especially since we are a vegan household! Our lightly modified version uses whole grain noodles and brown rice. I had to substitute some of the flavorings since the baharat spice blend wasn’t at my initial disposal. Start by preparing the rice, noodles and lentils. We always have a batch of brown rice prepared and warmed in the rice cooker. Boil the lentils in two cups of water with the seasonings for 20 minutes. When finished drain and rinse with cold water. Boil the noodles in normal fashion and drain. In a wok or large pan combine and warm (at low temperature) the rice, noodles and sauce and then flavor to liking. Try Marinelli’s all-natural Italian pasta sauce which is handmade in small batches. It’s also vegan and Non-GMO Project certified. Separately sauté the onions and add to the medley along with the chickpeas. Serve with your favorite organic greens and whole grain bread slices. Don’t waste your mind striving towards the accumulation of non-essentials. Put it to great use like the people of Egypt and create beautiful wonders that heal and nourish such as the famed Koshari dish. Live life people!